Description - Our 7mm Textured Flex Tiles were designed to be super durable, multi use floor tiles. While the textured surface is smoother than the coin, it still provides a non-slip flooring surface that is easily cleaned. 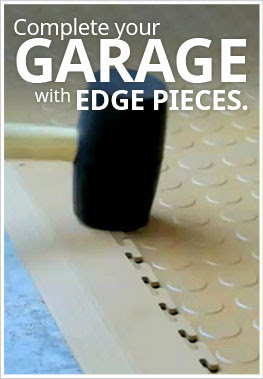 These garage floor tiles are made from virgin, hard wearing, proprietary PVC polymers that are injected molded at over 500 tons of pressure into molds with tolerances of 1/10,000th of an inch. That makes them supremely resistant to most solvents and chemicals and provides excellent thermal and acoustic insulation. Material - Our flex tiles are constructed entirely of a proprietary blend of flexible virgin PVC that guarantees the most durable garage tile on the market. This custom blend tile also ensures that the tiles are flexible and have the anti-fatigue flooring qualities often associated with rubber flooring but also the durability, long life, and chemical resistance associated with PVC tiles. Size - 20.5" x 20.5"
Recommended Uses - The 7mm Textured Flex Tiles are a durable and versatile floor tile. The textured floor tiles have been successfully used as home and commercial garage flooring, trade show flooring, retail store flooring, in stadiums and military bases, on storage shed and locker room floors, and in home gyms, airplane hangars and in commercial use garages, laundry room, utility room, mud room or, workout room flooring, and basement flooring to name a few. These tiles typically work well in any area where an extremely durable, resilient flooring surface would be useful that looks great and is easy to maintain. Sweeping any loose dirt, dust, or debris from the vinyl floor tiles when necessary. Periodic damp mopping of the tiles with a mild soap and water solution. Some common soaps often used are dish detergents and tide laundry detergent. Note: This is not a stain proof product. Street tar can cause staining to light colored tiles and in most instances, this staining can be remedied with a cleaner called Purple Power. If you have performance tires, staining can occur with light colored tiles. In most instances, this may not be remedied with a cleaner. If the staining on your floor does not dissipate, please contact our dedicated Customer Service team at 800-613-0996 who can further assist you. First, clean your sub floor so it is free of all dirt, grease or debris. Snap a chalk line on the sub floor 20” from one wall in your room. Snap another chalk line on the subfloor 20” from an adjacent wall. You should now have a pair of perpendicular lines making an approximate 90-degree angle. Begin laying the interlocking tiles along the chalk lines, snapping the locks together as you go. Leave the perimeter of the room open until the field is installed. After the field is covered, go back and cut in lines along the walls in the room. Leaving a gap at the wall roughly the thickness of tiles being used is recommended to account for expansion and contraction of the floor tiles in varied temperature ranges. Note: When piecing interlocking tiles together, adhesives are usually not used since the weight of the locked together product is usually enough to keep the floor tiles from moving. However, if you do experience movement and would like to ensure that the tiles do not slide at all, some double-sided tape or mat tape can be used around the perimeter of the installation to prevent any movement. Long lasting and extremely tough floor tile. Easy to install and keep clean. Highly resistant to most chemicals and solvents. How does this flooring handing the use of a spot welder in a garage setting? Our 7mm Textured Flex Tiles can handle the use of a spot welder over them. For the most part, the sparks from the use of the welder will not affect the floor. If a very hot spark were to linger for a period, you might see some melting where the spark landed. Other than that, these tiles were meant for this type of install. What is the warranty for 7mm Flex tiles? The warranty period for our 7mm Textured Flex Tiles is 25 years, and it is a manufacturer's defect warranty. Does this have any toxic additives like phthalates? I am considering using this in a garage with a gym where I would sometimes lie on the floor doing workouts. Our 7mm Textured Flex Tiles are phthalate free. If you would like the testing for this product, please feel free to reach out to one of our Flooring Heroes via phone, text, or chat. I was looking for some flooring for an exercise room in my basement. I considered concrete paint but the prep process and questionable results and durability was a concern. I also considered rubber floor tiles but after reading about the possibility of a strong smell (and having experienced this with a rubber horse stall mat) I kept on looking. Somehow I stumbled onto the PVC flex tiles and they seemed like the perfect solution. I was initially concerned about their ability to stand up to heavy weight (I have a power rack with several hundred pounds of weight plates) but the web site description indicated it wasn't a problem. These tiles were easy to install, fairly easy to cut with a sharp knife and real easy to cut with a circular saw when finishing the edge. I couldn't be more pleased with the results and am seriously considering using them in my garage. Thank you for your interest in Garage Flooring Inc.!